NOAA has an Adopt a Drifter program! The program is meant to work with K-16 teachers from the United States along with international educators. 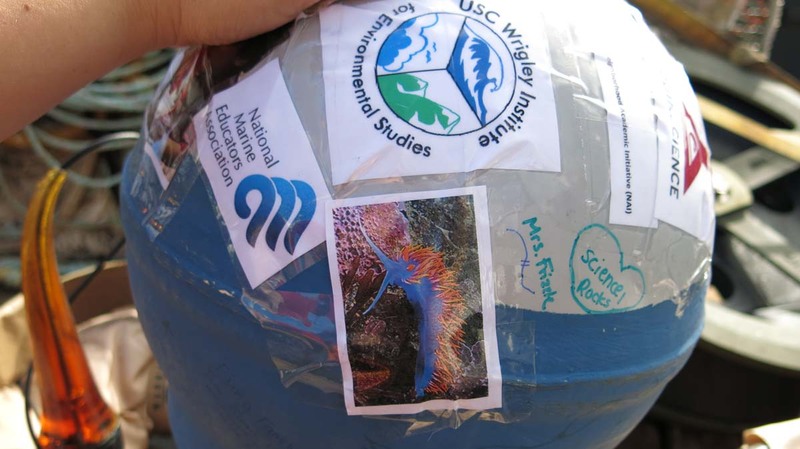 This program provides teachers with the opportunity to infuse ocean observing system data into their curriculum. This occurs by deploying or having a research vessel deploy a drifter buoy. A drifting buoy (drifter) is a floating ocean buoy equipped with meteorological and/or oceanographic sensing instruments linked to transmitting equipment where the observed data are sent. 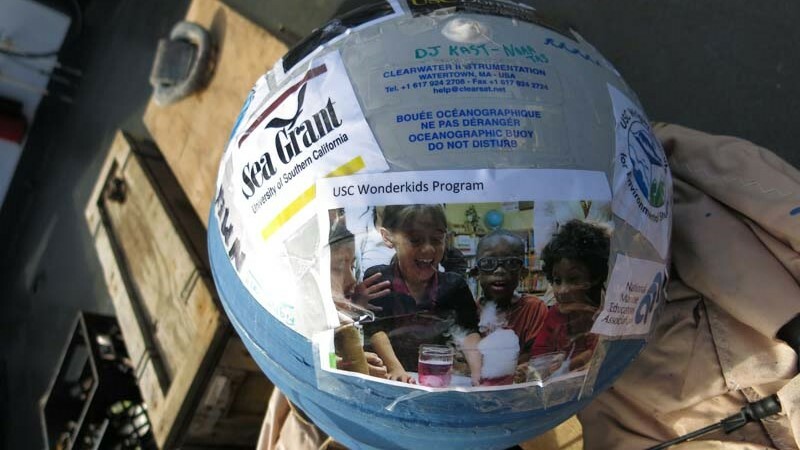 A drifting buoy floats in the ocean water and is powered by batteries located in the dome. The drifter’s sea surface temperature data are transmitted to a satellite and made available to us in near real-time. The teachers receive the WMO number of their drifting buoy in order to access data online from the school’s adopted drifter. 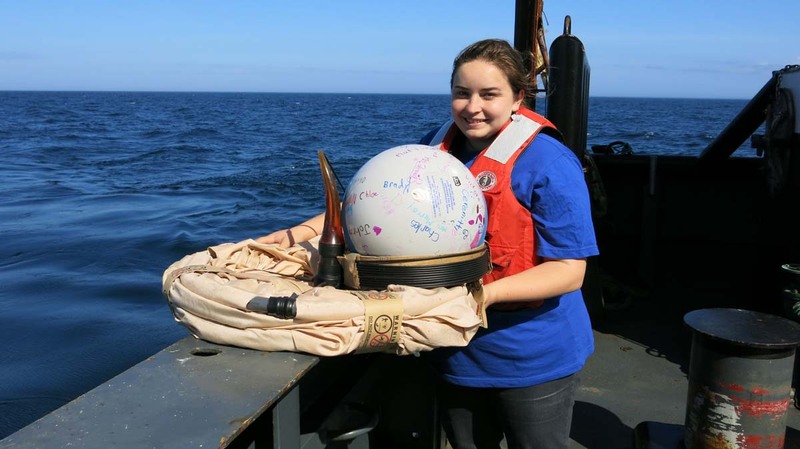 Students have full access to drifting buoy data (e.g., latitude/longitude coordinates, time, date, SST) in real or near real-time for their adopted drifting buoy as well as all drifting buoys deployed as part of the global ocean observing system. They can access, retrieve, and plot as a time series various subsets of data for specified time periods for any drifting buoy (e.g., SST) and track and map their adopted drifting buoy for short and long time periods (e.g., one day, one month, one year). I am receiving one from the Chief Scientist onboard the NOAA Ship Henry B. Bigelow so the students in all my programs can access it, and this will be helpful to convey modeling of currents, and can help build models of weather, climate, etc .I was so excited when I found out that the chief scientist would be giving me a drifter for me and my students to follow. 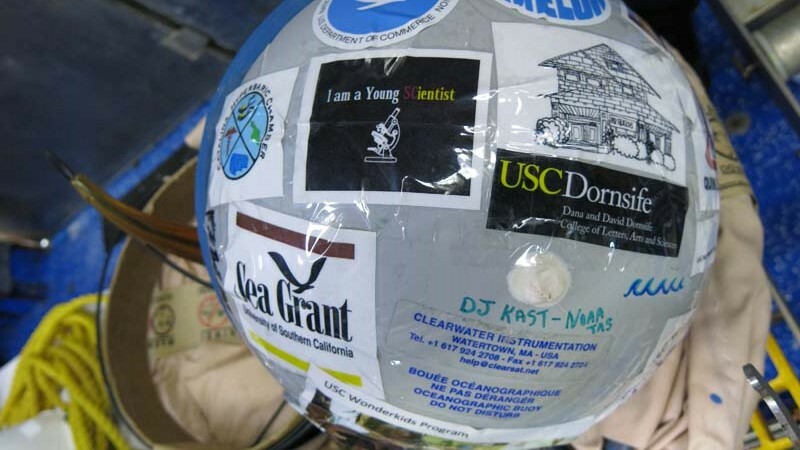 I decorated the buoy with programs that have inspired me to apply to the Teacher at Sea Programs, the current programs I am working for at USC (JEP & NAI), my family, and my mentors. Representing the USC Readerplus Program that hosts my Wonderkids Programs. Photo by Jerry Prezioso. 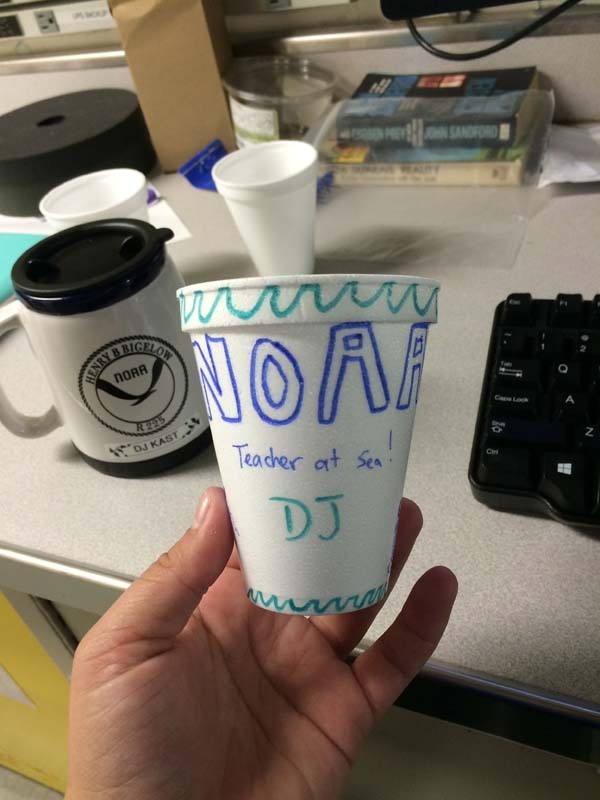 Quick change into my NOAA Teacher at Sea Shirt. Thank you so much for all these opportunities. Photo by Jerry Prezioso. 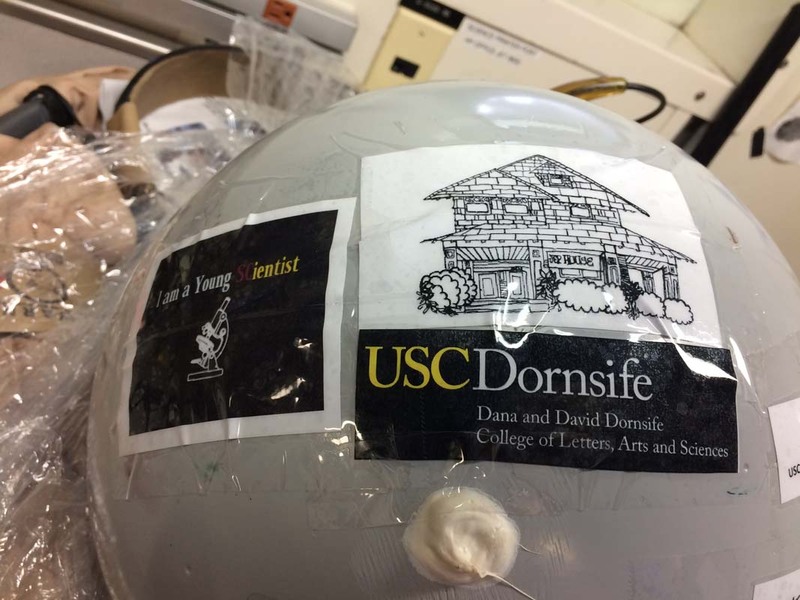 I am teaching a marine biology class this summer for the USC Neighborhood Academic Initiative program. 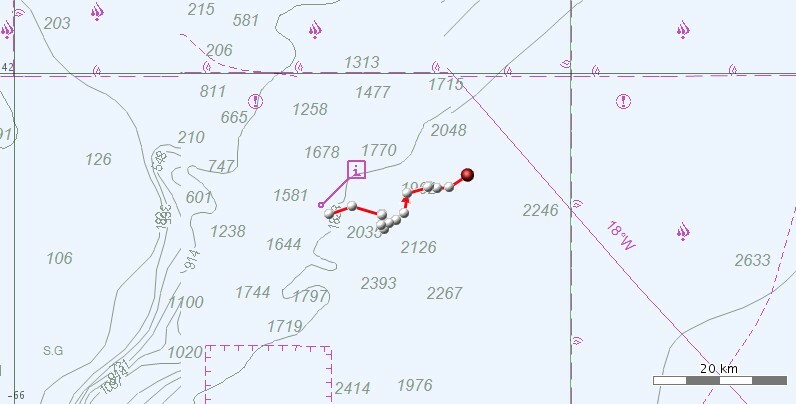 I am so excited to be following the drifter buoy # 39708. It was launched at 8:53 EDT on May 28th, 2015 and its first official position is: 41 44.8 N 065 27.0 W. I will definitely be adapting a few of the lesson plans on the following site and creating my own to teach my students about weather, climate, and surface currents. 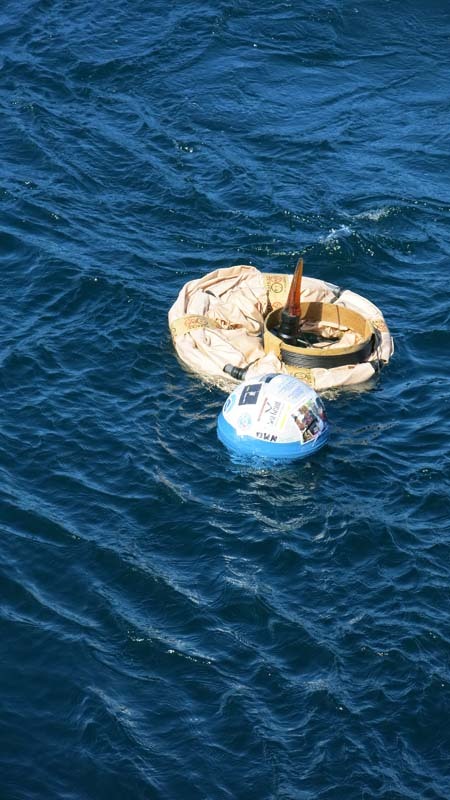 Photo of the drogue deployed in the water. From the NOAA Adopt a Drifter Program website. 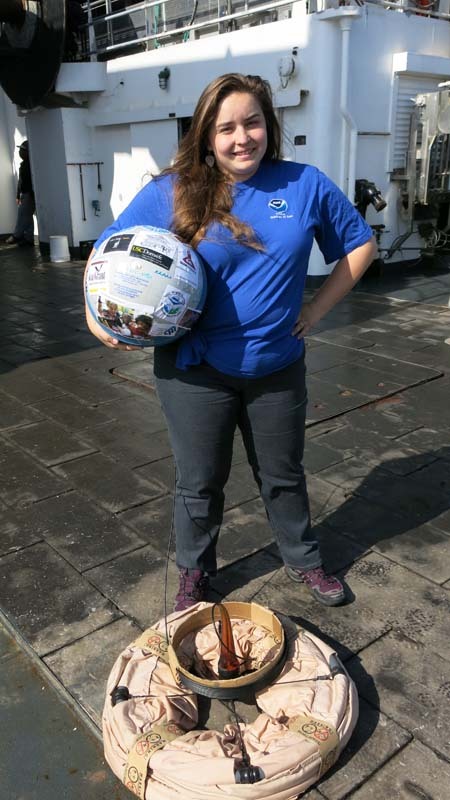 Photo of me with the St. Joseph buoy that will also be deployed. Photo by Jerry Prezioso. The easiest way to track these buoys in real-time is to use the Argos website https://argos-system.clsamerica.com/cwi/Logon.do. Guest account: Username: BigeloTAS and Password: BigeloTAS. Once logged in, select the “Data access” tab on the top left side of the screen. Select “Mapping”; a pop-up window will appear. Ensure “by ID numb. (s)” is selected from within the “Platform:” option (top left). Enter your desired ID number in the search field at the top of the screen. Enter the number of days for which you’d like data (20 days is the maximum). Select “Search” to generate a trajectory plot for the given parameters. To save data into Google Earth format, simply click on the Google Earth image (second tool from the right on the map settings bar, found just below the “Search” tab). You’ll need to save data at least every 20 days to ensure no interruptions in your final track line. Of course, to view the track line in its entirety, open Google Earth and ensure all of the data files are selected. If you desire to look at the data, not the track lines, go to “Data access”, then “Messages”, and enter your desired ID numbers. Again, data is only accessible for the most recent 20 days, so if you’d like to download the data for archival purposes, go to “Data access”, then select “Message download”. From here, you’ll want to save the data in .csv, .xls, or .kml format. My buoy 39708 is transmitting properly and providing quality data! Below are some of the maps of its early trajectory and its current movement so far. While we were deploying the buoys one of the engineers named Rahul Bagchi brought over a strainer that is attached to the water intake pipe. The strainer was covered in Sand Lances. Fortunately, there are another two scientists on board that need sand lance samples for their research purposes and they were collected. My research scientist friend Jessica needs the otoliths or fish ear bones for part of her research on cod, since sand lances are eaten cod. Otoliths are hard, calcium carbonate structures located behind the brain of a bony fish. 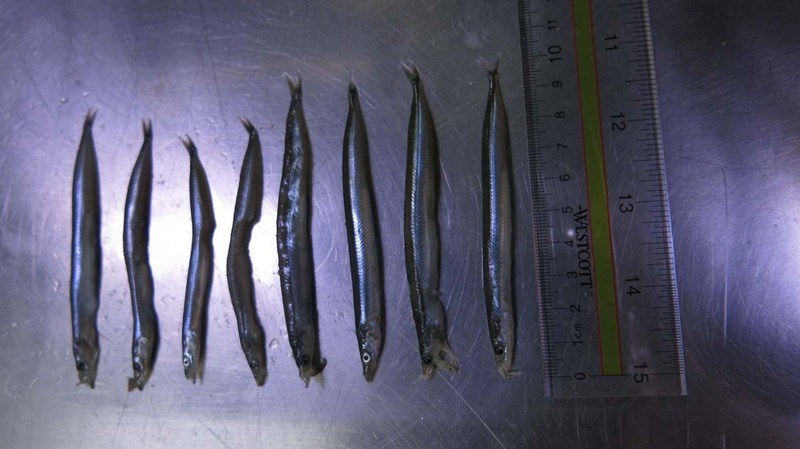 Different fish species have differently shaped otoliths. They are used for balance and sound detection-much like our inner ears. They are not attached to the skull, but “float” beneath the brain inside the soft, transparent inner ear canals. 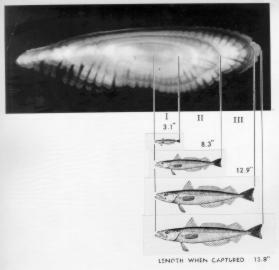 The otoliths are the most commonly used structure to both identify the fish eaten by consumers up the food chain, and to age the fish itself. 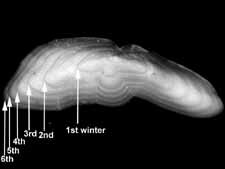 The otoliths also have daily growth bands. 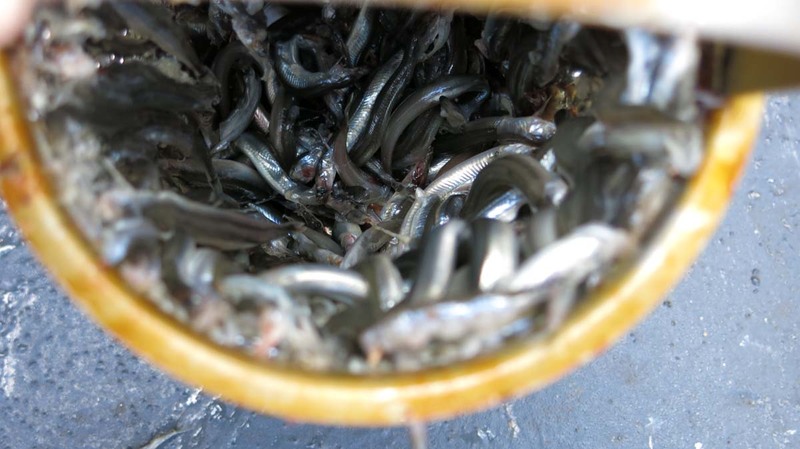 Alaskan Fishery scientists manipulate the daily growth bands in salmon larvae creating an otolith tag that identifies where the fish came from by controlling the growth rate of their fish populations. 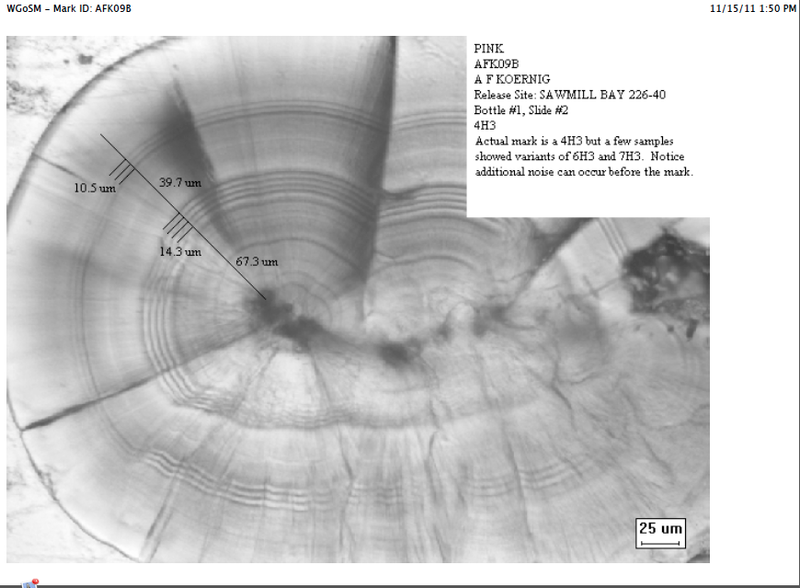 New material (protein and calcium carbonate) is added to the exposed surface of the otolith over time, showing a fish life history (otolith start growing at day 1 even in larval stages). The lighter zones have higher calcium deposit which is indicate summers, while darker zones have higher protein levels which indicate winter. One pattern of a light and dark zone indicate a year and is consequently how the fish is aged. Jessica Lueders-Dumont is using the otoliths for three main purposes in relation to her Nitrogen Isotope work. 1. She is hoping to see the changes from year 1 to the adult years of the fish to give an accurate fish life history and how they relate to the rest of the Nitrogen isotopes in the area’s food chain. 2. To see how current nitrogen isotopes compare to the archeological otoliths found in middens or sediment sites, since otoliths can be preserved for hundreds of years. 3. 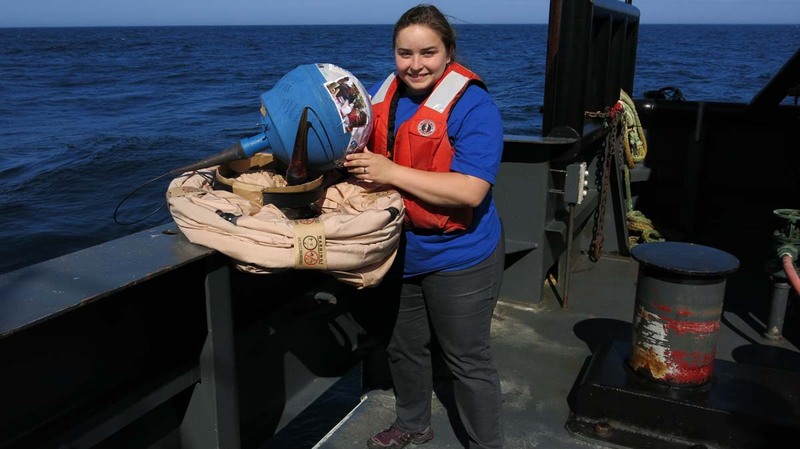 She is trying to create a baseline of nitrogen 15 in the Gulf of Maine so that she can see biogeochemical evidence of the N15 she finds in plankton in higher trophic levels like fish. 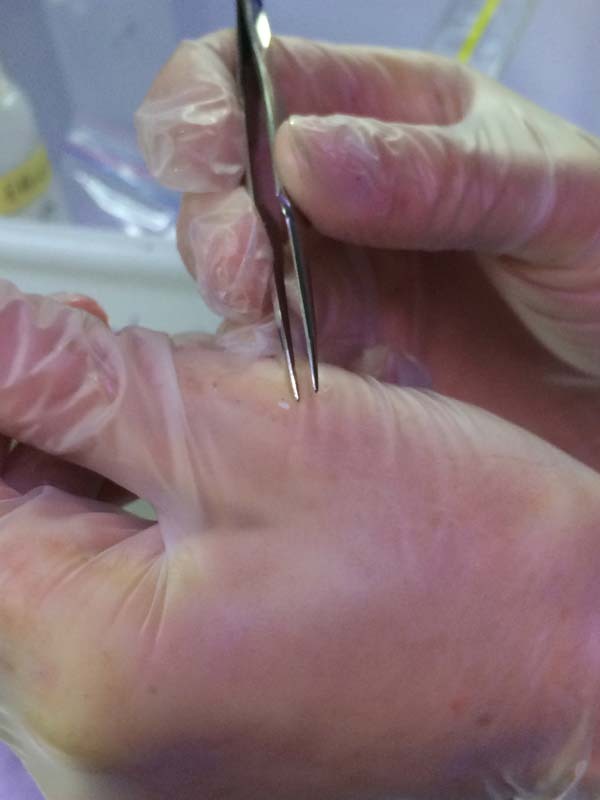 I will definitely be dissecting some fish heads with students to check for otoliths and using a microscope to age them. 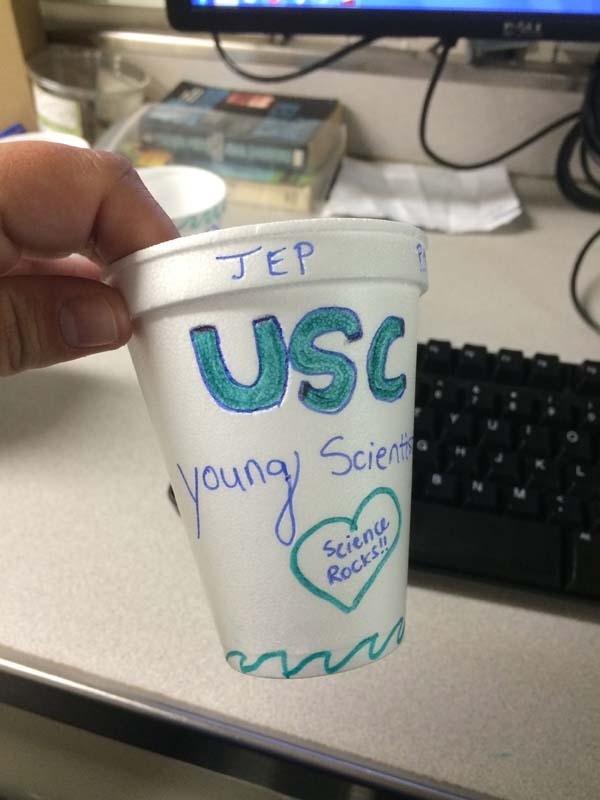 The chief scientist and I decided we should put some Styrofoam Cups under pressure. 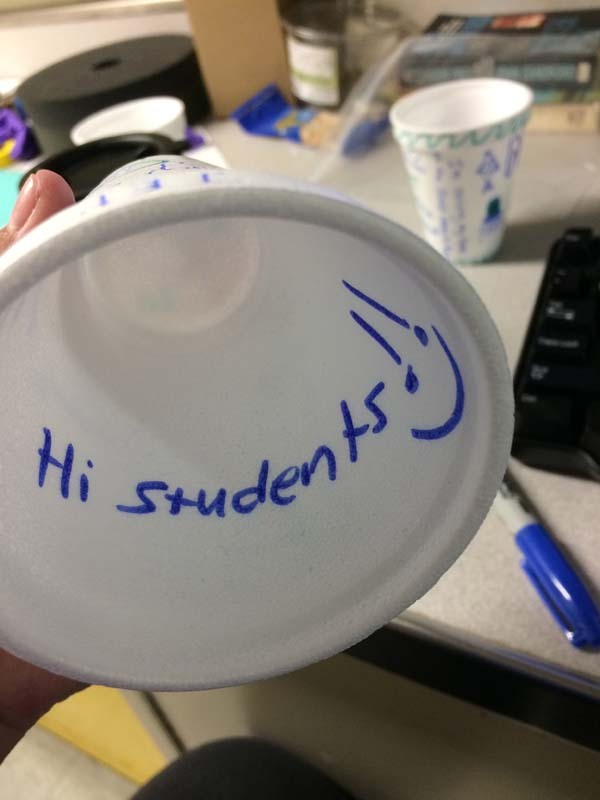 This polystyrene foam is full of air pockets. This is important because the air pockets (volume) shrink with increasing pressure, essentially miniaturizing the cups. 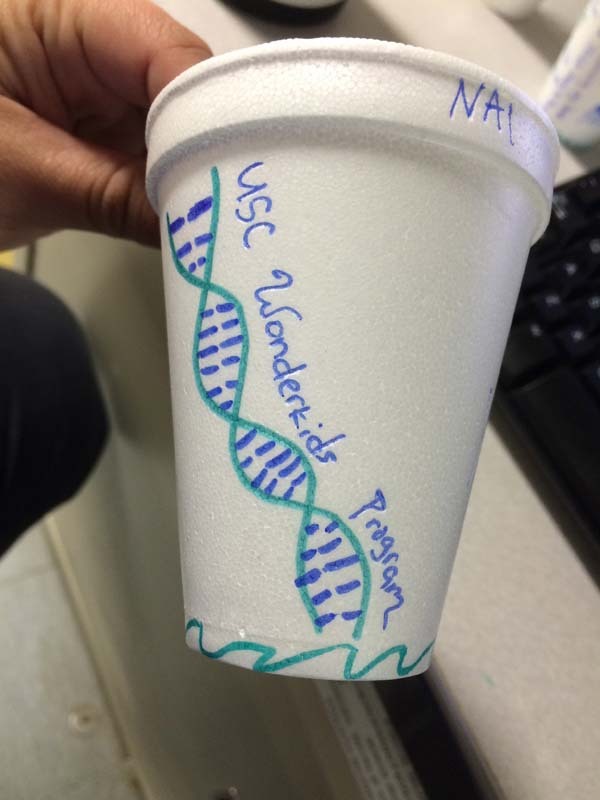 USC Wonderkids Program on a Styrofoam cup before shrinkage. Photo by DJ Kast. After Photos: the Styrofoam cups went down to 184 m or 603 ft on the Rosette/ CTD in South George’s Basin. 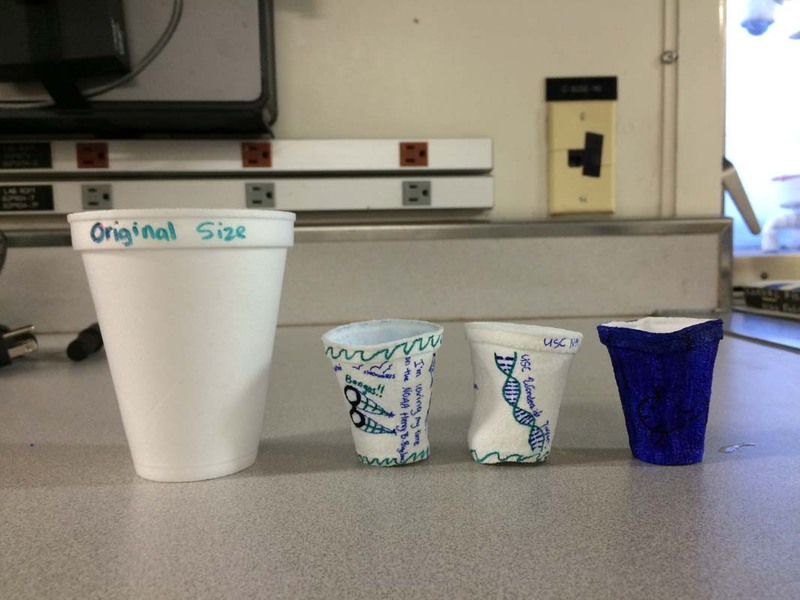 Cups compared to the original size (front). Photo by DJ Kast. 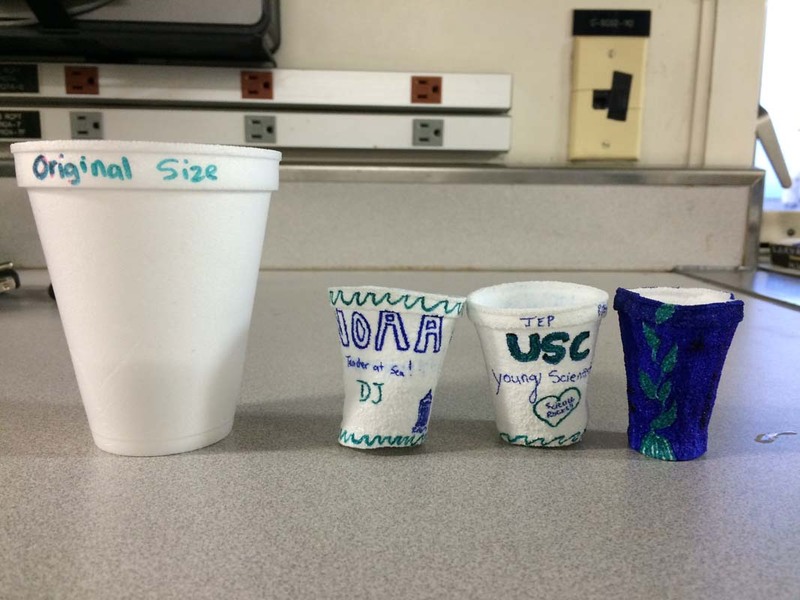 Cups compared to the original size (back). Photo by DJ Kast. Everything was decluttered, packed, cleaned and mopped in the lab. We cleaned our staterooms and bathrooms to get ready for inspections by the captain. Now that the work is done, a few of us have discovered the foosball table in the upper lab. It was great fun! Playing foosball on a moving ship that is heaving, pitching and rolling puts a new dimension to the game. 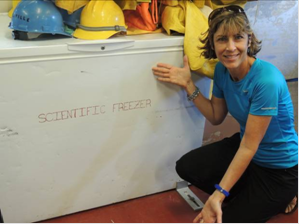 Science ships are not the only ones that names cold storage areas for science needs, as my students can attest to! For our last dinner on the ship, wild game from South Africa was grilled. Not only was there kudu again (yum!) but we had ostrich and springbok. Some type of squash was also grilled. All were tasty; the ostrich kind of sweet and surprisingly looked like steak, too. I couldn’t decide which was more delicious, the springbok or the kudu. It was fun to try some new foods, and I don’t know when I will get the opportunity to do so again. There was also some ice cream made from cheramoya, a Chilean fruit. After dinner, which is served at 5, a group of us also were shown the crow’s nest above the bridge. We had to climb up a vertical ladder – no stairs – and pop out of a manhole to go into it and look out the windows, and only two people could fit at a time. Part of the radar is housed here. If you climbed up yet another ladder, there was the highest platform you could stand on, and the view was great! The sunset from here, and the full moon rising, was quite a sight. Still, there was no land on the horizon. Later in the evening, I went to one of the upper decks to just look at the stars. Even with the brilliant light from the moon, the clear view of the stars and the southern hemisphere constellations was breathtaking. In the morning, we would be in the Galapagos Islands. 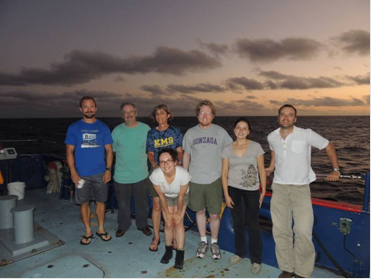 The science team is ready to disembark and relax from working continuously for 14 days on the R/V Melville, not to mention the days working on the ground while the ship was in port. The data will be analyzed and soon the WHOI team will get ready for the next deployment and recovery in Hawaii. I will be back home, ready to begin my summer vacation from school! I have really learned a lot from each member of this team. It has been a privilege to work with them and know that they will go with me to my next students. 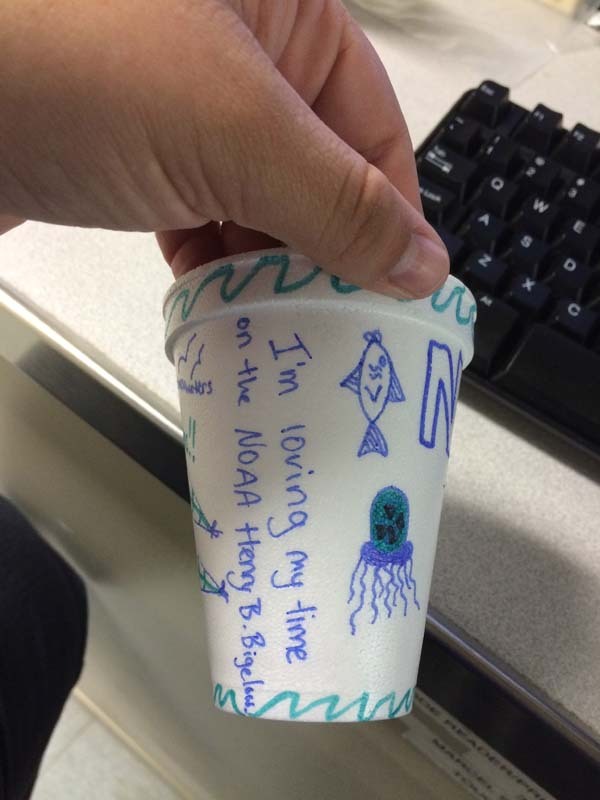 SO: When did you first become interested in oceanography? RW: At first in college. I was a biochemistry major, but it seemed to be more memorization and not enough thinking skills. Also at the time, I was working for an Oceanography professor at Harvard, making deep sea pressure gauges, learning how to machine parts, very hands-on, and really liked that, so I changed to Engineering and Applied Physics to go into Oceanography. SO: It’s such a broad field, how did you narrow your focus down to moorings? 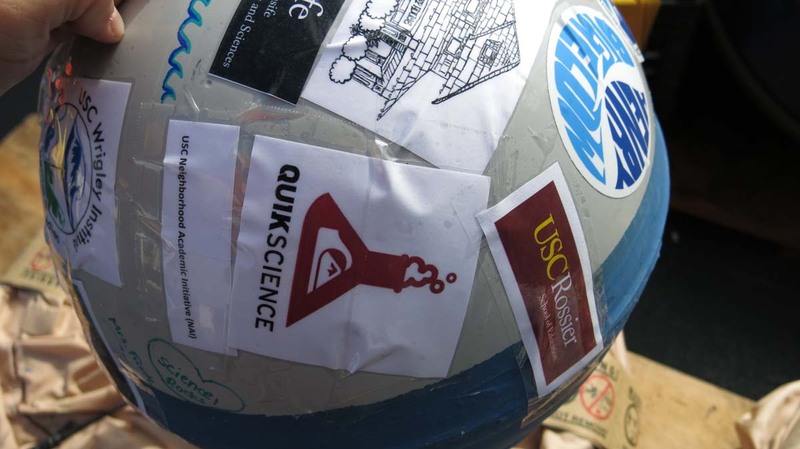 RW: For graduate school, I went to Scripps Institute of Oceanography (part of University of California, San Diego) and my advisor was working in upper ocean physics. No one had had success observing the wind-driven or Ekman currents, and that became a goal. As part of work toward a thesis, I designed a new current meter capable of observing near-surface currents in the presence of wave motion. This current meter was particularly needed for use on surface moorings, and is still in use. There was a lot of progress to be made in surface moorings – as of the mid 1970s the longest experiment using one was about 30 days, as one that was in the Gulf of Alaska did. Meanwhile, at WHOI, after WWII, there were lots of resources and they were getting pretty good at sub-surface moorings (no surface float, the buoyancy is below the surface, away from wave motion). After grad school in the late 1970’s, I came to WHOI, and began to work on improving surface moorings and using them for studying the upper ocean. By the 1980’s, we were up to a surface mooring lasting 6 months. SO: Have you been to all of the worlds’ oceans with buoys and moorings? RW: I have not been to the Arctic or the Southern Ocean, if defined as 45 beginning at South, but soon! SO: Mistakes are something we like to avoid, but has there been some trial and error that has turned out helpful in the long run? 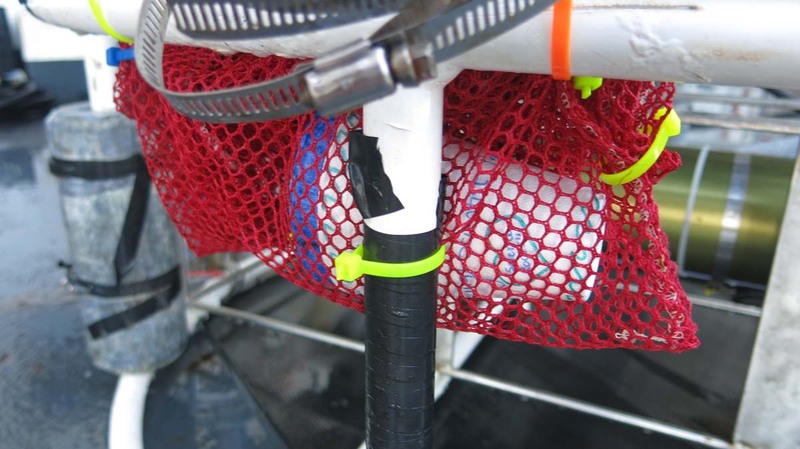 RW: We have made progress on changing the materials of buoy from aluminum to the materials we use now. There was a surface mooring near Iceland that did not last and the reason turned out to be a low-tech piece of forged metal hardware that failed from cyclical fatigue (flexing and bending, responding to tension changes) so we had to improve our mooring designs and the hardware we used. Also, after that failure in 1989 the Navy funded work to improve how we design surface moorings for challenging locations. This work continued as we prepared to deploy a surface mooring in the Arabian Sea in the mid-1990s. That surface mooring survived the monsoon season so we knew we had improved our design. 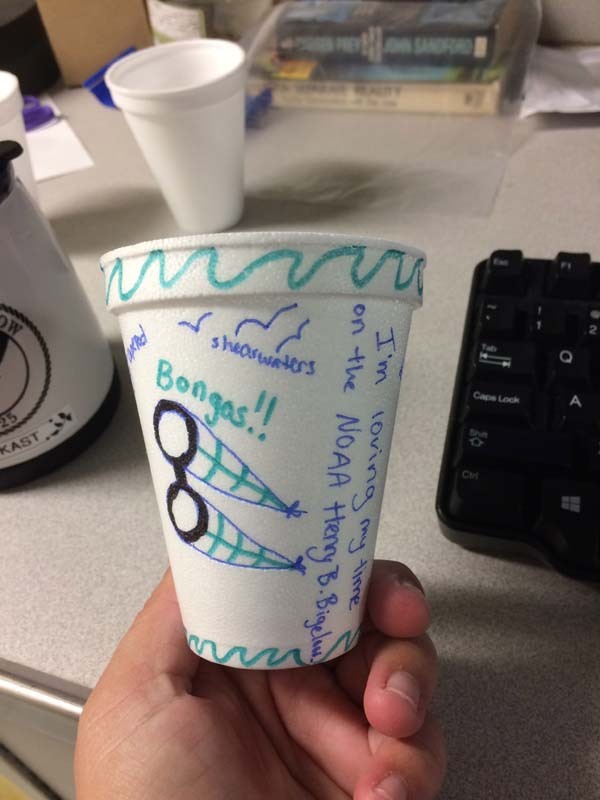 With the Stratus project, we started out thinking that the cold water from upwelling was making its way out to the eastern tropical Pacific causing the cooler ocean temperatures. After studying this, we have found it was not the case, so we continue to look for the cause. 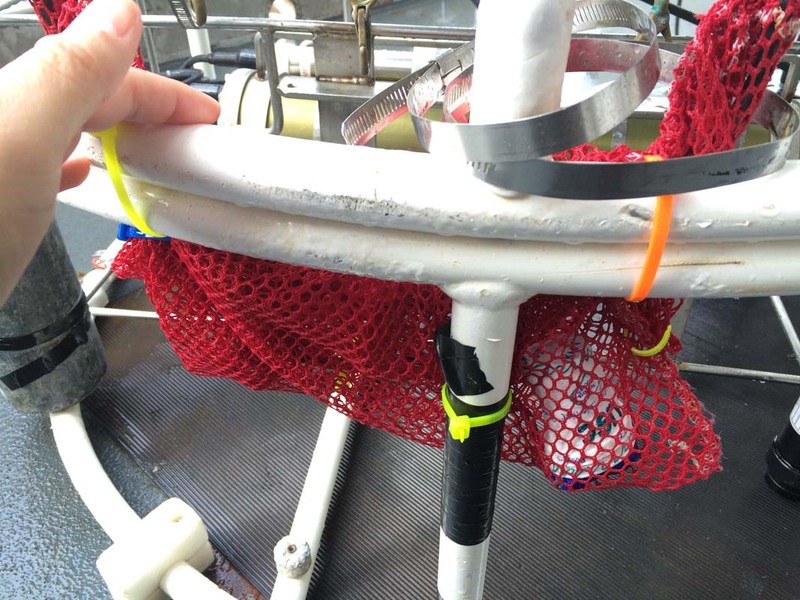 This year, we deployed the mechanical current meters deeper into the ocean to try to avoid the fouling by barnacles as well as the fishing line which causes them to stop working (gets into propellers) and also to get ocean currents over more of the water column. What we found was that the battery life was shorter where the temperatures were colder at these depths, so we did not recover a year of data from them. We also tried some new current meters which worked really well. SO: You are working on a small part of climate research, a very long-term issue and a big picture, what is the reward of your part of the research? 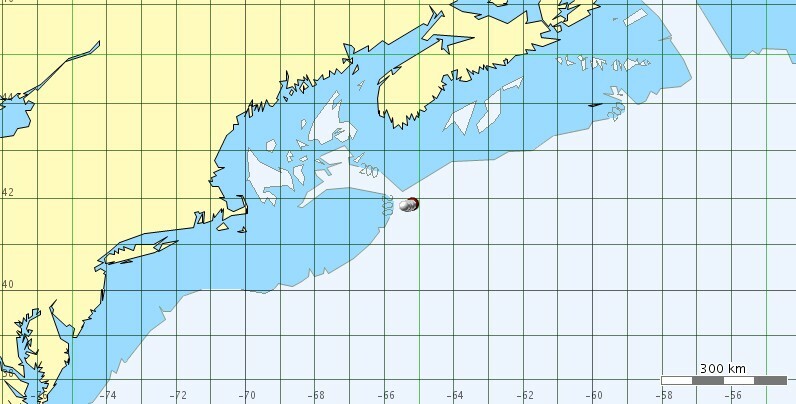 SO: WHOI maintains 2 other buoys; can you talk about the importance of these locations? RW: The 3 buoys together occupy the trade winds areas. One is north of Hawaii, and there is a rising level of carbon dioxide there. We are seeing the ocean’s absorption of CO2 has been rising faster than the rate of increase of CO2 in the atmosphere. Also, over a decade, weather patterns have been changing near Hawaii and the ocean is becoming more salty due to less precipitation; the hydrologic cycle is changing which has practical implications, too. The trade wind regions are where tropical storms transit, strengthening with energy out of the ocean; we should know more about this. The other location, near Barbados in the Atlantic, is where Atlantic hurricanes often transit. SO: Can you tell me some more about the drifters we have launched? RW: The drifters are an international program that NOAA is invested with, and first of all, they take sea surface temperature (SST) measurements. SST is measured worldwide by satellites, but this is through clouds and aerosols (atmospheric impurities) and is hard to get SST precise to a tenth of a degree. The satellites are calibrated using the SST provided by the surface drifters. The goal is to have 2 drifters per 5 degree (latitude and longitude) square which is a challenge. In the southern ocean, they add barometers to the surface drifters to help predict storms. 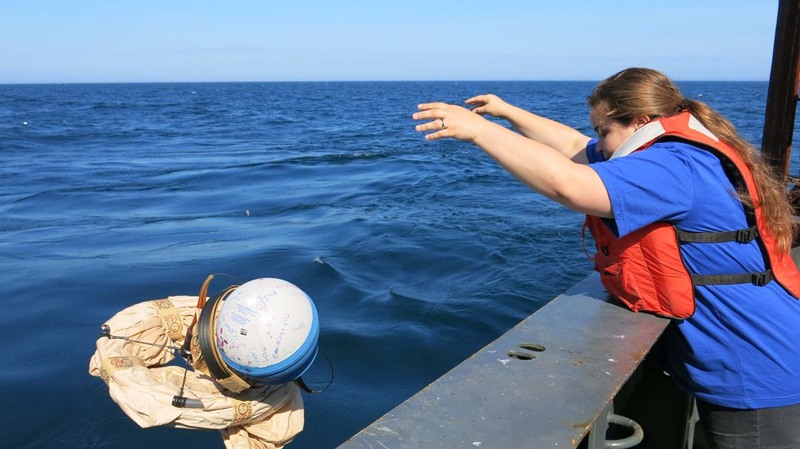 The ARGO floats are also an international effort; the goal is to try to have one in every 3 degree square of ocean, to surface every 10 days to calibrate ocean models. This helps us understand rising sea levels, which happen as the ocean warms and expands as well as when polar ice melts. 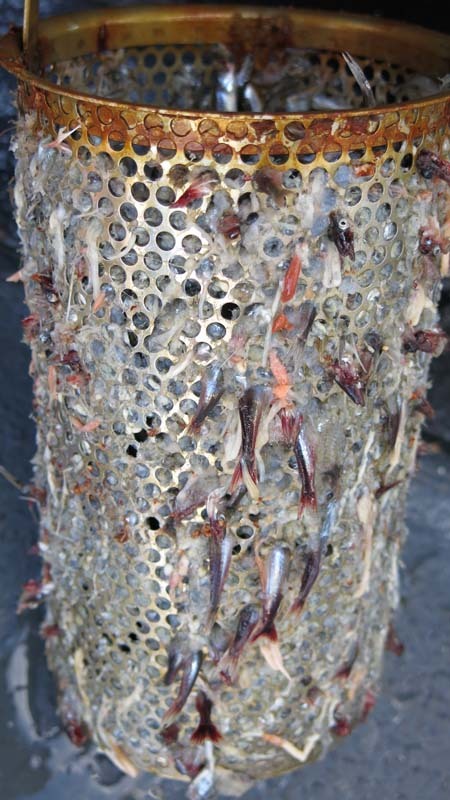 They go to 1,500 to 2,000 m to find the heat content of the ocean. They last about 4 years and there are about 3,000 of them worldwide. SO: If you were to go into another area of ocean research, what would it be? RW: We have seen that there is a warm salty layer and a fresher cooler layer below. It would be interesting to study what is causing the mixing between these layers and how the wind plays in. SO: In what areas of Oceanography do you foresee a lot of career paths and job opportunities? RW: In terms of locations, The National Science Foundation in international collaboration is looking to have a 25-year study including the Gulf of Alaska, Greenland, and off the Southern tip of Chile and Argentina. There is a lack in information about these important high latitude areas. There is a growing demand for AUVs (Autonomous unmanned vehicles) which have many applications. Designing and applying AUVs as well as surveying the ocean floor. Ocean acoustics is another field of growth. Bathymetry and physics of the ocean as well as marine policy/ social science are other areas. There are lots of applications of technology. SO: What about in biology of the oceans? RW: In studying fisheries, you quickly learn that you can’t study a species in isolation and that other factors such as the physical structure and variability of the ocean and local human activities that affect the habitat are important. 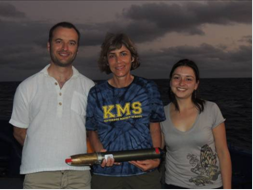 The other members of the science team bring varied backgrounds that have transferred well into oceanographic research. 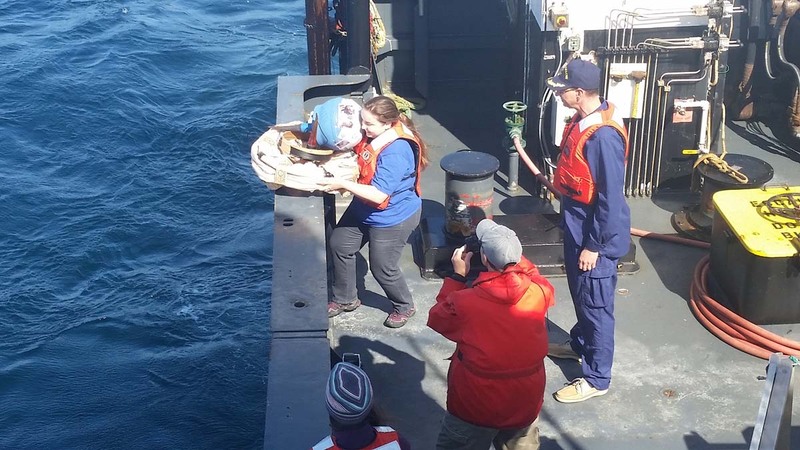 Their college degrees were not all oceanography, but their skills and knowledge are helpful in their jobs. Some of their former experience includes computer programming, biology, finance, data analysis, and mechanical design. 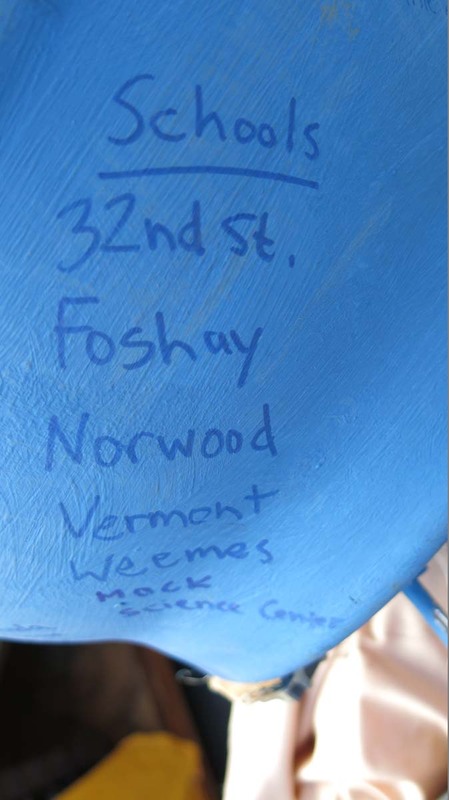 Two attended the Scripps Institution of Oceanography, and one Florida State, before coming to Woods Hole. 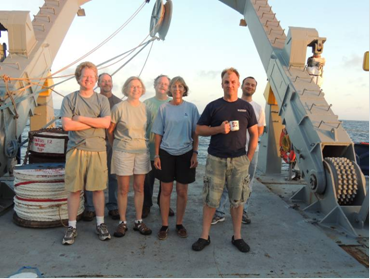 There are yet more WHOI folks behind the scenes, back in Cape Cod, supporting this research cruise in other ways. 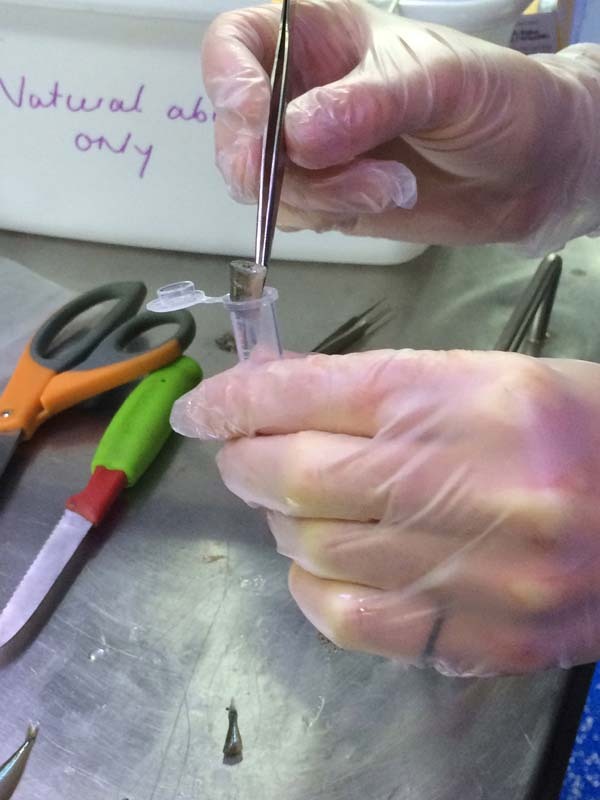 Not everyone is needed (or cares to participate) in a hands on, 24/7 research cruise. 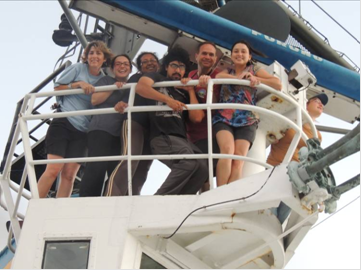 The team collaborates with other nations and with the global science community of oceans and climate research not only by sharing data, but by lending their expertise in a hands-on way. 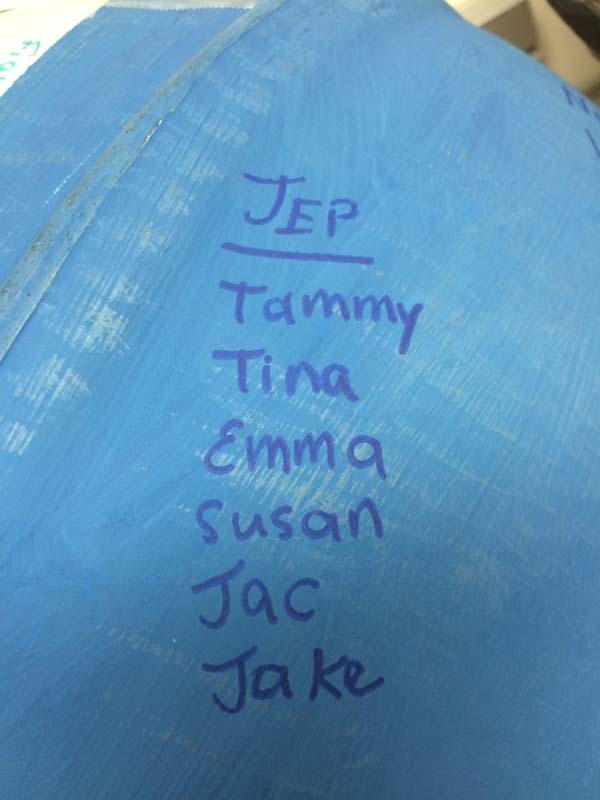 Jeff will be traveling straight to Australia to support a project there before he even goes home to Cape Cod. 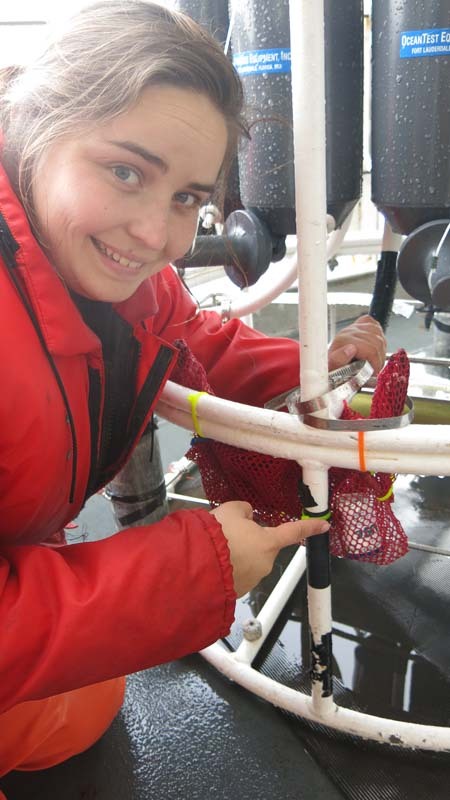 Some of our others include a biology graduate student, who works on the biological changes at the Mt. St. Helen’s volcano with Washington State University; international participants in the cruise are studying topics such as oceanography of the fjords in southern Chile and phytoplankton in the Pacific Ocean. 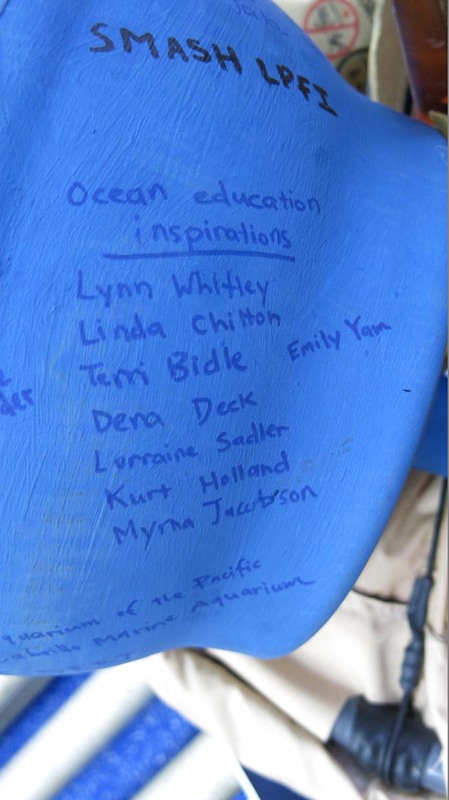 By working with these folks, I have seen that the Scripps Institution of Oceanography (at University of California San Diego) and WHOI are two of the USA’s preeminent institutions in preparing for ocean science careers. 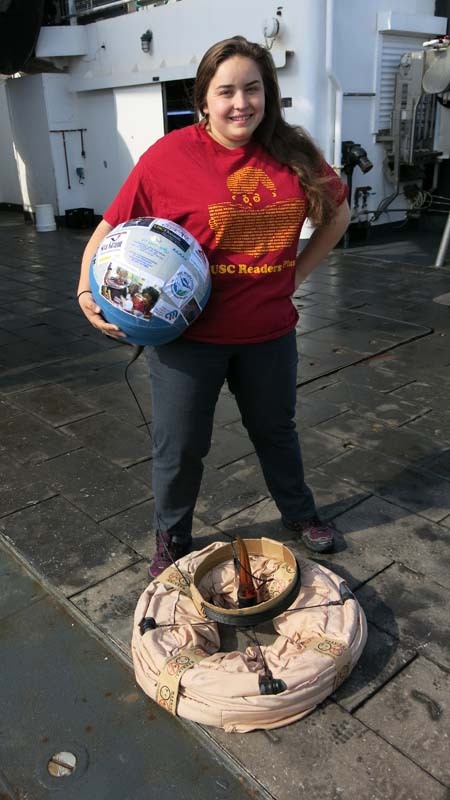 Both have excellent outreach to schools, not only by supporting the Teacher at Sea program, but by providing web based educational resources and student activities. This is my UCTD watch – Sebastien, Ursula and I held down to 8 watches and launched hourly UCTDs to gather salinity, temperature, and salinity data. WHOI’s mission statement reads – “The Woods Hole Oceanographic Institution mission is to promote research and education to advance understanding of the ocean and its interaction with the Earth system and to communicating this understanding for the benefit of society.” I have been enriched and am very grateful to have had a part in carrying out this mission. 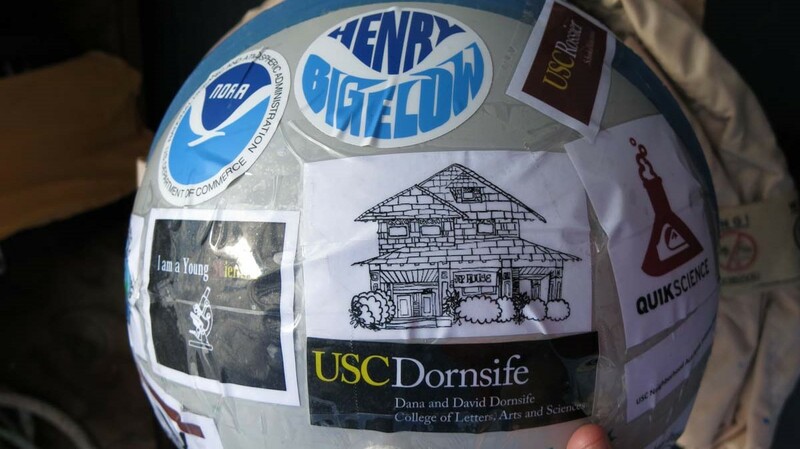 Thank you, NOAA, WHOI and Scripps!